The VersaFrame is a construction system that allows teams to build an upper frame in whatever configuration they can imagine. Pre-drilled holes are designed to be used with #8 screws and 5/32" rivets, and can be easily drilled out for larger hardware. 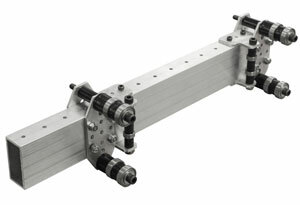 VersaFrame extruded square tube is a custom thickness sized specifically for the FRC market. With 0.040" and 0.10" walls, the tube is lightweight and more than strong enough for most FRC applications. C-channel and angle pieces help to provide even more strength where it's needed most. Note: 1" x 1" tubes are pre-drilled on all four faces, and 1" x 2" tubes are pre-drilled on the 1" faces with piloting notches on the 2" side. For a detailed BOM with parts necessary to construct a linear elevator, see the drawing for 217-4399. Material Thickness 0.040", 0.090", or 0.10"